SpaceX CEO Elon Musk, at right, might be reflecting upon whether firing Rajeev Badyal, who was the SpaceX vice president in charge of the Starlink program was a smart decision. Badyal was reportedly hired by Amazon CEO Jeff Bezos for his newly revealed broadband satellite constellation, code-named Project Kuiper. After GeekWire published their exclusive report on Thursday that Amazon is joining the race to provide broadband internet access around the globe with thousands of low Earth orbit satellites, Amazon started posting almost 80 jobs for Project Kuiper on its website that will require employment in Bellevue, Wash., a stone’s throw away from Elon Musk’s SpaceX’s headquarters in Redmond. However, two key engineering positions have already been filled by Amazon CEO Jeff Bezos, according to CNBC. Joining Project Kuiper will be Rajeev Badyal, who was the SpaceX vice president in charge of Musk’s Starlink program, and Mark Krebs, a veteran of Google’s aerospace efforts who played a key role in developing the first two prototype Starlink satellites for SpaceX. Both Badyal and Krebs were let go following last year’s Starlink reorganization. However, being fired oftentimes provides the opportunity to succeed, like Bill Belichick who was kicked to the curb by the Cleveland Browns and then went on to take a unique place in NFL history, as the first person ever to earn eight Super Bowl rings. 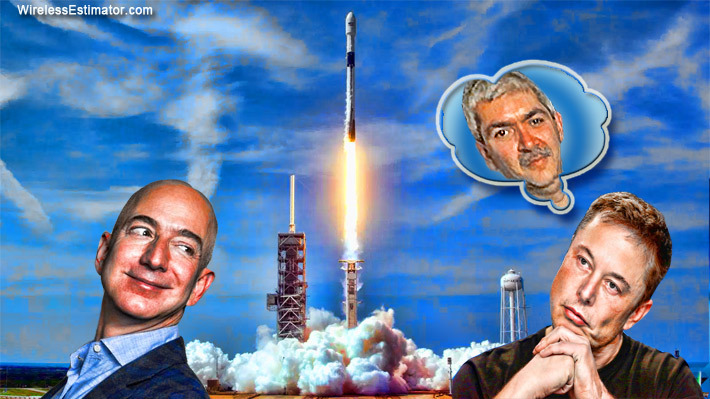 But there are more rivals for Amazon than SpaceX in the constellation market. OneWeb consortium and Telesat, Canada’s biggest satellite operator, have made significant progress in campaigns to put hundreds of broadband data satellites in low Earth orbit, or LEO. Projct Kuiper’s first public step took the form of three sets of filings made with the International Telecommunication Union last month by the Federal Communications Commission on behalf of Washington, D.C.-based Kuiper Systems LLC. Project Kuiper’s plans to put 3,236 satellites in low Earth orbit — including 784 satellites at an altitude of 367 miles; 1,296 satellites at a height of 379 miles; and 1,156 satellites in 391-mile orbits.